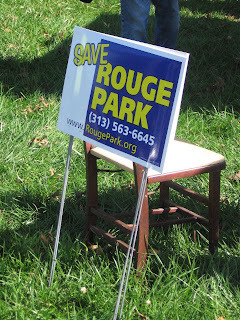 The Friends of Rouge Park will have their next working meeting this coming Wednesday, February 21 at 6:00 p.m. The group will meet in St. Suzanne School, which is located at West Chicago and Westwood. Those attending this meeting are asked to enter through the back door of the school building. A map to the location is available online here. Everyone who lives near Rouge Park, or who simply has an interest in seeing the park become a cleaner, safer and more attractive resource is invited to attend. THE BATHROOMS ARE CRUMBLING, DECAYING, OPEN TO TRESPASS AND TO PROSTITUTES AND NARCOTIC USERS..
N/DOVER..ALL NORTH OF W. WARREN..
Good luck,, you'll need it.